The Cooper-Young Community Association opened its doors to the four candidates seeking the District 10 seat on the Shelby County Commission on April 8, giving each of the four a chance to discuss his views on the open position. 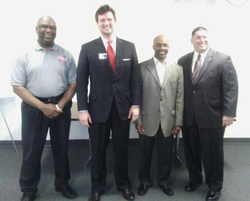 The candidates in attendance were Democrats Jake Brown, Martavius Jones and Reginald Milton and Republican Geoff Diaz. All will compete in the May primary election. Before the four had the opportunity to address the group of about 30 Cooper-Young residents, former County Commissioner Mike Ritz explained the duties of the political organization. “Counties do everything until the city comes up and does it. If the city comes up and does it, it trumps the county,’ Ritz said. Diaz will advance to the August general election, as he has no competitor from the Republican Party. “I would like to bring a return to politics as it’s supposed to be,” Brown said. Jones, former budget chair of the Memphis city school board, spoke of budget cuts that followed Shelby County and Memphis school consolidation. “I can articulate the needs of the school system to my colleagues on the county commission,” Jones said. Jones was asked about recent reports that he has failed to pay $12,000 in property taxes on property he recently inherited. “Being a financial advisor does not make me immune to family tragedy,” Jones said about why the taxes were unpaid. Jones said that he inherited the property, and he was just recently made aware of the problem. He said he thought the escrow was paying the taxes, but he found out that was not true. Jones said he “corrected” the problem, and it has no effect on his campaign. Milton said he has devoted his career to being a community organizer. He is determined to prevent and change any blight in District 10. “Neighborhoods are like people. They can get sick. They can even die…. We aren’t going to let that happen,” Milton said. After the candidates had spoken and answered questions from Cooper-Young residents, Brown’s campaign manager, Angela Barksdale, challenged them. “I’m going to hold all four of you gentlemen accountable for what you say you’re going to do. I would appreciate it if politicians reach more towards the people. Then you find out what the problems are and what the causes are,” said Barksdale. The primary elections takes place May 6. The general election is set for Aug. 7. Voters can register at the Shelby County Elections Commission at http://www.shelbyvote.com.